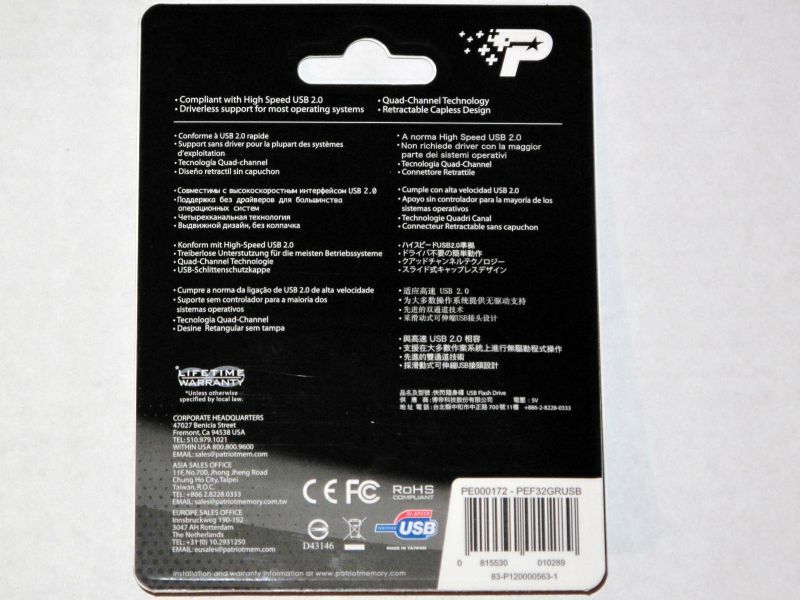 Patriot is known for their blazing fast flash based memory. Whether its that new Sector 7 RAM kit, their newest SSD, or a simple flash drive, Patriot has always held the bar high for its products. Today we take a look at the newest release in the USB line-up, the Patriot Xporter Rage 32GB drive. With the ability to have data transferred across 4 NAND chips, the enhanced performance should be nothing to joke about. Join us as we take a look at what the 32GB Rage drive has to offer. The Patriot Extreme Performance Xporter XT Rage is a USB Flash Drive with both performance and functionality. Featuring an innovative Quad Channel configuration, data is intelligently managed and transferred simultaneously to 4 NAND chips resulting in vastly enhanced performance, particularly write speeds: Rage improves on traditional USB 2.0 Flash Drives to offer up to 27MB/s read and 25MB/s write transfer speeds. Functionality and durability is designed in to the Rage with its rubber coating on the housing and retractable USB connector: the Rage is easier to hold and use, more durable to drops and daily abuse and the connector is protected when not in use. The Patriot Xporter Rage is available in 8GB, 16GB, 32GB and 64GB capacities and carries a lifetime warranty. 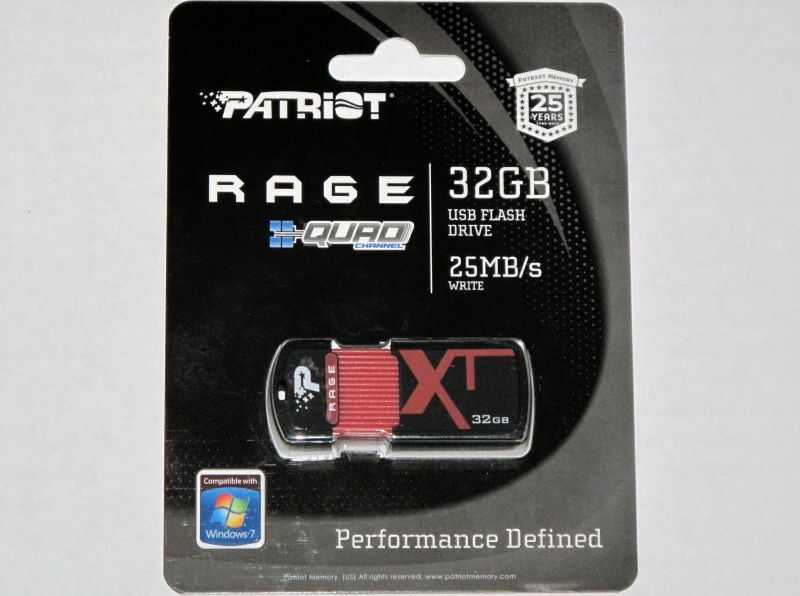 The Patriot Xporter Rage 32GB drive was packaged in the typical “Blister Pack” packaging. Let me be the first to say that I truly despise this type of packaging. You always end up having to use a knife or scissors to open the packaging, and with a rubberized product like this, you risk damaging the appearance. On a lighter note, this packaging is good in the fact that little to nothing can happen to your product when this type of packaging is used. As you can see, there is not much to the blister packaging. The picture on the left is the front, and the picture on the right is the rear of the packaging. Didn’t you write about a Quad-channel USB 3.0 drive a few weeks ago? Here is its. It was the Express drive. Not only is this drive much much faster, even in a USB 2.0 port, but it is CHEAPER and arguably better looking too. And when I finally get that machine wiht a USB 3.0 port, I am going to be in nerd heaven. That is correct. The Super Talent drive reviewed by Matt Homan is faster. That is not surprising, as it is a newer technology. I’d assume many people know the name Patriot a little better and would rank their products a little higher. This would be why you are paying for the name “Patriot” a little more. The Xporter series is designed with an active lifestyle in mind. While the Super Talent drive appears nicer, if you looked at the two side by side, you can tell this to be true.